Simple Inked allows you to set 2 rounds of automatic appointment reminders. The first round can be set to automatically send a certain number of days before your clients' appointments, then the second round can be set for a less number of days before the clients appointment. 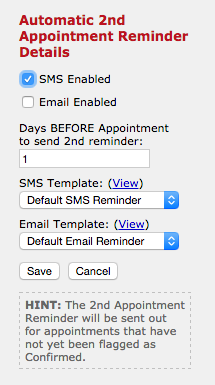 Enabling the 1st and 2nd round of appointment reminders. Go to Admin, then into SMS & Email and in the 1-Touch Marketing section you have the 1st Appointment Reminder and the 2nd Appointment Reminder. If you haven't yet setup your 1st Appointment Reminder, Edit the 1st Appointment Reminder and on the right side panel tick SMS Enabled and/or Email Enabled. Also enter in the number of days before the appointment that you want this first round of auto reminders to be sent (i.e. 2 days), and click Save. Do the same for the 2nd Appointment Reminder. 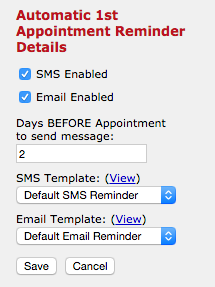 Edit the 2nd Appointment Reminder and on the right side panel tick SMS Enabled and/or Email Enabled. Also enter in the number of days before the appointment that you want this first round of auto reminders to be sent (i.e. 1 day), and clickSave.